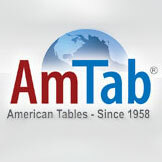 AmTab is an exceptional American manufacturer of mobile and stationary folding furniture products serving the educational, hospitality, healthcare, banquet and industrial markets. Their general furniture line includes high-quality folding tables, activity tables and stages and risers, but they may best be known for their top-of-the line cafeteria tables and institutional lunch room furniture. Features like Dyna-Rock edges, square steel tubes and high-powered, high-speed gas cylinders make Amtab cafeteria tables one of the most trusted brands on the market. A well balanced, strong underside with 14 gauge steel construction keeps tables flat and sturdy for years of service. Mobile stool tables have a patent protected square stool column which eliminates stool spinning and makes seat installation faster and easier. If there's a way to make a better lunchroom table, AmTab's already done it. Folding tables by AmTab are a masterful feat in engineering. Dynalite folding tables have 14-gauge steel tube legs, a rigid, heavy duty honey comb core and is wrapped in 100% pure, high impact ABS plastic on both the top and bottom of the table. All welded, unitized heavy duty steel internal frame work provides strength and stability for years of use. EZ-Tilt mobile tables, seminar tables and cafe tables offer compact storage, spring loaded T-Autolocks and come standard with Dyna-Rock edges for extra durability. When AmTab puts some much engineering into a lunch table designed to hold a tray of food, you can imagine how well they engineer a stage designed to hold the weight of an entire performance. Traditional stages and risers are available in modular fashion to create custom and portable stages and choral risers. For ease, many prefer complete stage sets that come with everything needed in one simple purchase. Mobile EZ Risers are one of the most simple all-in-one riser units available. The patent pending design allows for a one person set up and ships completely assembled, including the back rails. All AmTab products are made with careful attention to the user's experience and uncompromising detail to quality. They are the leaders of innovative product design in our industry providing cutting-edge engineering. AmTab products are built to last using the highest quality raw materials and state-of-the-art manufacturing. All AmTab furniture products are proudly manufactured and assembled in the USA and carry a full 15 year warranty on all parts.